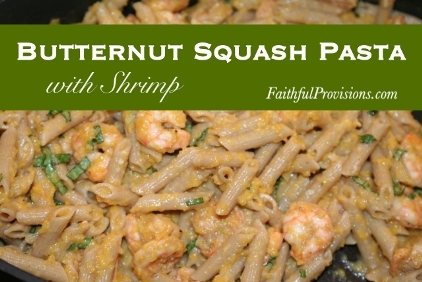 If you’re enjoying all the squash that is in season now, you’ll love this recipe for Butternut Squash Pasta with Shrimp! * It’s another great flavor combination and truly makes for a satisfying meal on a chilly fall day. Just below the recipe, you’ll find step-by-step pictures with instructions for making this delicious Butternut Squash pasta dish! Warm 3 tablespoons of olive oil in a large, heavy skillet over medium-high heat. 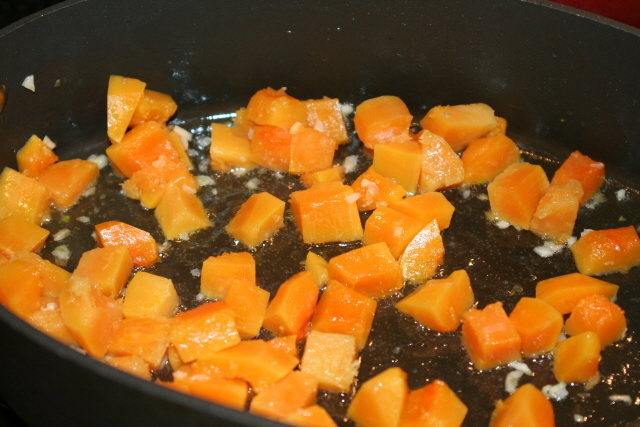 Add the butternut squash, garlic, 1 teaspoon salt, and ¼ teaspoon freshly ground black pepper. Saute until the squash is golden and tender, 5 to 7 minutes. Add the stock, bring to a simmer, cover, and cook until the squash is very soft, another 5 to 7 minutes. Transfer the squash mixture to a food processor and puree. Add the pasta and cook until tender but still firm to the bite, stirring occasionally, about 8 to 10 minutes. Drain pasta. Meanwhile, warm the remaining 3 tablespoons of olive oil in a large, heavy skillet over medium-high heat. 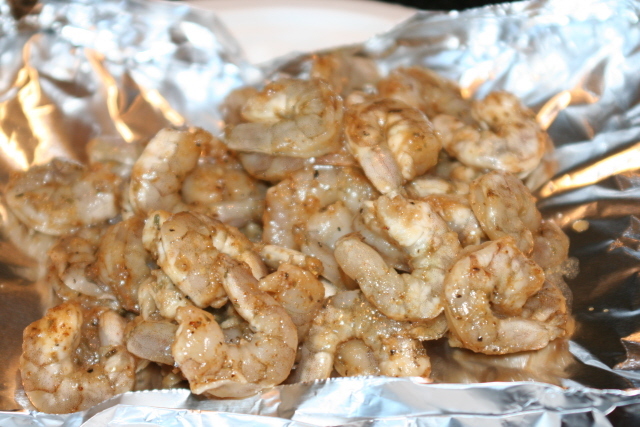 Sprinkle the shrimp with the remaining 1 teaspoon of salt and remaining ½ teaspoon of freshly ground black pepper. Add the shrimp to the pan and cook until just pink, about 3 minutes. In a large pot over low heat combine the cooked pasta, pureed squash mixture, and ¾ cup milk. Add the remaining ¼ cup milk if the sauce needs to be moistened. 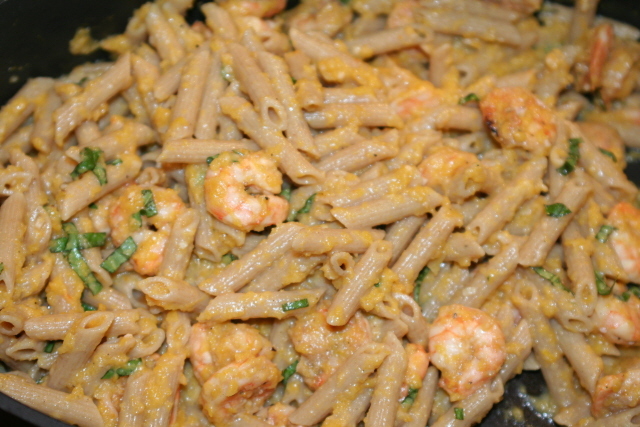 Add the cooked shrimp, basil, and cheese. Stir until warm and serve. 1. Warm 3 tablespoons of olive oil in a large, heavy skillet over medium-high heat. Add the butternut squash, garlic, 1 teaspoon salt, and 1/4 teaspoon freshly ground black pepper. Saute until the squash is golden and tender, 5 to 7 minutes. Add the stock, bring to a simmer, cover and cook until the squash is very soft, another 5 to 7 minutes. Transfer the squash mixture to a food processor and puree. 2. Bring a large pot of salted water to a boil over high heat. Add the pasta and cook until tender but still firm to the bite, stirring occasionally, about 8 to 10 minutes. Drain pasta. 3. Meanwhile, warm the remaining 3 tablespoons of olive oil in a large, heavy skillet over medium-high heat. Sprinkle the shrimp with the remaining 1 teaspoon of salt and remaining 1/2 teaspoon of freshly ground black pepper. Add the shrimp to the pan and cook until just pink, about 3 minutes. (I grilled mine, see picture). 4. In a large pot over low heat combine the cooked pasta, pureed squash mixture, and 3/4 cup milk. Stir to combine. Add the remaining 1/4 cup milk if the sauce needs to be moistened. Add the cooked shrimp, basil, and cheese. Stir until warm and serve. Be sure to stay tuned next week for another recipe using pasta with butternut squash: Butternut Squash Lasagna. 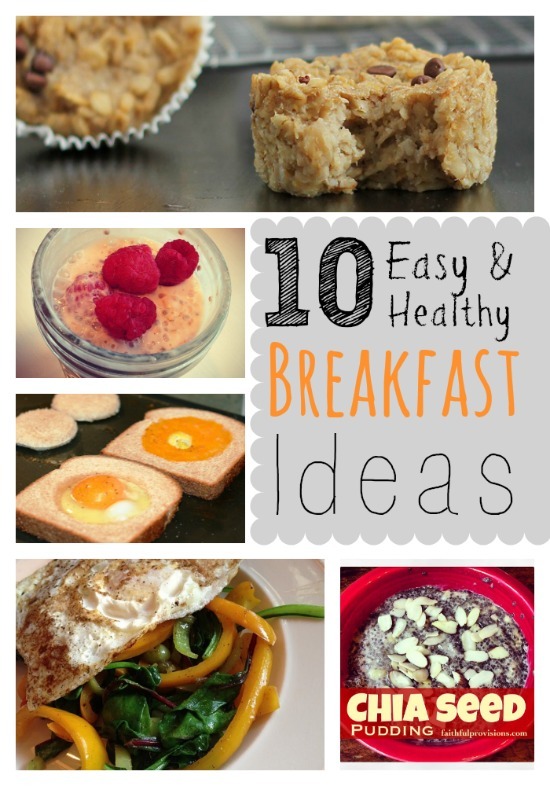 *This is recipe is adapted from one of my favorite dishes by Giada de Laurentis!